For the first layer, mix together one Funfetti Aqua Blue cake mix, egg and oil. Press into a foil lined, greased, 9×9″ pan. Bake at 350 degrees for 10-12 minutes. For the second layer, spread one container of marshmallow cream over the first, still warm, layer. I put large spoonfuls of marshmallow cream all over the bottom layer and then carefully, pressed and spread it out until it cover the it completely. 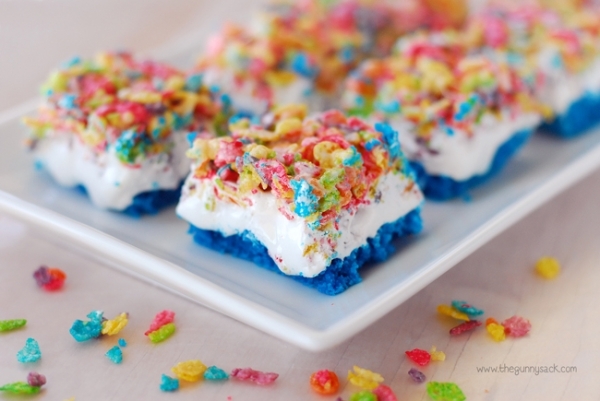 For the top layer, make Fruity Pebble bars. Microwave 1 1/2 tablespoons of butter for 20 seconds in a large bowl, until melted. Add 3 cups of mini marshmallows and stir to coat. Microwave for 45 seconds and stir until smooth. (If the marshmallows aren’t completely melted, microwave for an additional 30 seconds.) Mix in 3 cups of Fruity Pebbles. Drop by large spoonfuls over the marshmallow cream layer and carefully spread out evenly. I put my hand in plastic baggie with a little butter on it and gently spread it out and patted it down.